We are specializes in providing a full range of solar water heater maintenance and repair services to our customers in Dubai. 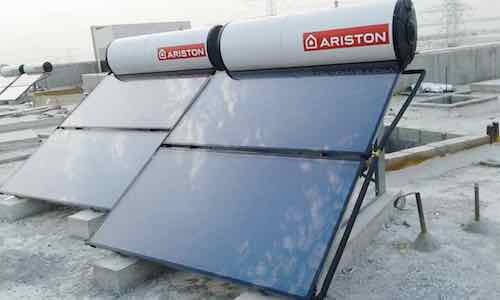 We are specializes in providing solar water heaters & re-manufacturing support and engineering services. Dxb Solutions provides "on-call" availability and quick turnaround on maintenance and repairs in Dubai. Solar water heaters typically require minimal maintenance. However, it is important to inspect your solar water heater at least once a year to make sure all components are in good condition and to keep the system working optimally. Solar collectors: Collectors should remain unshaded. It’s quite common for panels that were in full sun when they were installed to receive shading due to tree growth. It may be necessary to trim or remove vegetation. Many states have solar rights laws that protect a solar homeowner’s rights to maintain sun access for existing systems. Dust and dirt can also hamper collector performance. In dry, dusty weather the panels may need periodic cleaning. Snow and ice usually melt off on their own, but may need to be removed in the event of heavy accumulations, especially if the panels are mounted at a shallow angle. The collectors themselves should be inspected for cracks or yellowing, and the seals checked to be sure they are still in good condition. Roof and support: Roof penetrations should be inspected annually to be sure there are no problems with water leakage. Nuts and bolts on racking systems should be inspected for tightness, and the racks themselves checked for signs of stress. Plumbing, pipes and valves: All pipes and valves should be checked for drips and leaks, and repaired or replaced if necessary. It’s also important to make sure the pressure relief valve is not stuck open or shut. Pump: It is very important that the pump remain in good condition, because pump failure can cause the system to overheat. High-pitched noises, burning smells and cold supply and return pipes are all signs that a pump has failed or is in danger of failing. Compromised pumps should be repaired or replaced immediately. Sensors and controllers: These components are part of the control system of your water heater, so it’s important that they function properly. To check a sensor, apply mild heat (wrapping your hand around it is usually sufficient). It should record the temperature rise. Heat transfer fluids: In UAE and similar climates, most solar water heaters utilize a glycol (antifreeze) solution. This fluid should be checked annually to be sure it is still in good condition. If the system is in a hard water area, the fluid may also need to be treated to prevent scale. Hot water storage tank: This should be checked periodically for cracks, leaks and/or corrosion. While many of these points can be checked by the homeowner, some (like glycol testing and replacement) are best performed by a solar professional. Contact us today to get in touch with our maintenance engineer.